Do you ever get that feeling when you take a look at your child, and be amazed by how fast they grow up? From an incredibly cute and dependent baby to an active, playful, and more independent tween in a blink of an eye, moms can agree that their kids grow up at such a fast pace. To become healthy and happy individuals, moms need to find fun and easy ways for their young ones to develop good habits. One of these is the proper brushing of their teeth. Some kids, though, find that brushing is unnecessary, tiring, and unenjoyable. To help mommies everywhere in making every brush time a happy time for their kids, here are some creative tips from Hapee Kiddie, one of the leading toothpastes for children’s oral healthcare. Some kids may not like their teeth getting cleaned, especially for infants who are teething with their young gums being tender. To make it more fun, you can sing their favorite tune for while cleaning their small teeth. You can also play their favorite music and invite them to dance to the beat or have them watch their favorite video, while still brushing their teeth. When the song or video stops after two minutes, they should be done. Playing Dentist with Your Child. There are kids who think that brushing aggressively for ten seconds, instead of the standard two minutes, is enough. They don’t know that this doesn’t work because they were not taught how to properly brush their teeth. A creative solution to this is to grab their favorite toy, preferably one with visible plastic teeth. Grab a clean toothbrush, and then pretend that you are bringing this toy to the dentist for the first time. You can pretend to brush its teeth, which you can later give the role of dentist to your child. This will allow them to use that same method for themselves. If you are struggling to get your kids motivated to brush their teeth, you can introduce a simple reward system. Every time that they brush their teeth well for two minutes, you can give them a sticker of a star. You can get creative with your rewards, such as rewarding them to ice cream if they get five stars or even giving them a toy they’ve always wanted after getting 20 stars! Have Them Pick their Toothbrush and Toothpaste. As they grow older, our kids want to become more independent, such as wanting to feed, bathe, and dress themselves. Use this eagerness for independence by having them pick their own toothbrush, whether it has their favorite characters, their favorite color, or even appealing features such as those that play music or flash lights. Just make sure that the toothbrush they pick has soft bristles. Your preschooler, with their love for sweet flavors and cartoon characters, can now choose and pick, thanks to Hapee Kiddie which is perfect for kids two to five years old. They can choose from seven kid-citing flavors that are sure to appease their mouths and two different packaging that feature their favorite characters from Disney’s Mickey and Friends and Frozen. Just like how eating meals together as a family is a must, brushing together can be another ritual that the whole family should do together. By brushing together, it shows the message that brushing is something that Mommy and Daddy do too. A family that brushes together has even more reason to smile. Chesca and Doug Kramer, oral healthcare advocates of Hapee Kiddie, practice this with their three kids. Before going to bed, Chesca would call her family, not just her kids but Doug too, “Let’s all go together to the bathroom. Let’s all brush our teeth!” She points out to this particular activity being helpful to making their kids enjoy brush time. Be Sure to Have the Right Toothpaste. One important thing to consider is their toothpaste. Their toothpaste must not only have the safe fluoride content for the child at their current age, it must also have something that would engage the kid. That is why to make Brush Time Hapee Time for kids of all ages, specific toothpastes were made for kids of all ages. For children from four to 24 months, Hapee Baby is your infant’s trusted toothgel with its baby-friendly formula that protects your baby’s milk teeth from cavity. You don’t have to worry since Hapee Kiddie toothpastes are formulated with the 1,000 PPM fluoride level recommended by dentists at this age. For kids ages 6 to 12, their fluoride and mint level get a boost while maintaining that same fruity Kiwi flavor with Hapee Buddy toothpaste. These toothpastes will definitely make brushing more fun and easier for your kid. Parents don’t have to fret with the challenging of their kids growing up as long as they make the right and proper adjustments. With these techniques, brushing does not have to be boring as long as we make brushing fun and exciting. 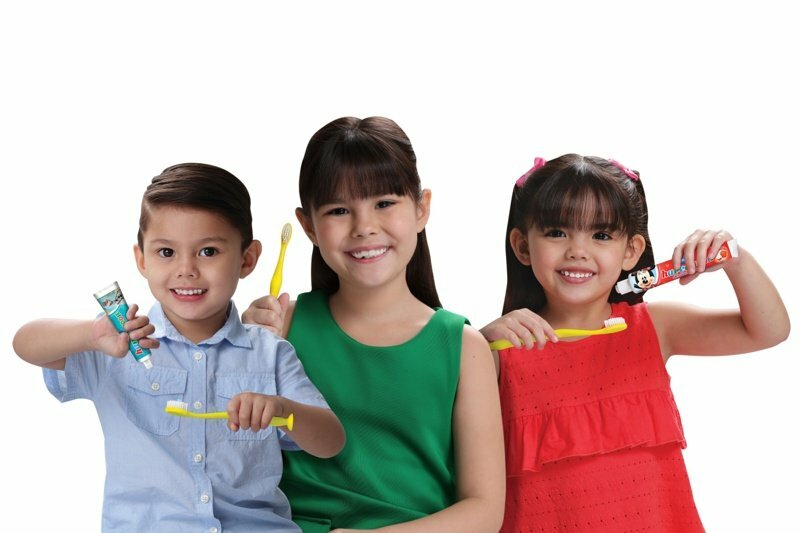 No matter what their age is, Hapee Baby, Hapee Kiddie, and Hapee Buddy are your child’s oral care companions in making Brush Time Hapee Time!